There's no other Scottish pursuit that produces the excitement levels that contact with a perfect hard fighting wild Atlantic salmon will do. Even the wettest of weather conditions are quickly forgotten when one of God's finest marine creations makes an appearance! One of the many attractions of this fantastic pursuit is not knowing what to expect regardless of what the weather or water conditions are doing. The most carelessly spoken words on any salmon river are often similar to 'you're wasting your time' or 'it's not worth fishing today' which should always be welcomed as they'll almost guarantee you a fish the same way forgetting to bring your landing net will too! Isn't it also strange how the rain always appears when you've forgotten to bring your raincoat! 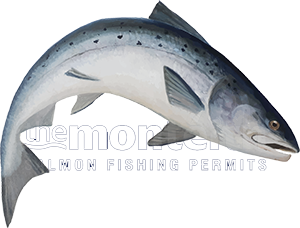 Preparing yourself properly for a visit to any salmon river is the most important starting point and too many anglers still turn up with inappropriate fishing gear which immediately puts them at a fishing disadvantage. Take the time to find out exactly what the best flies or lures are well before your fishing date and make sure your waders are in good order along with all other salmon fishing kit items. I once recall an angler turning up with a salmon fly reel that the internal components had completely corroded and jammed and it took half a can of WD40 and nearly and hour to get his reel working adequately again! I don't know of any Scottish ghillies that don't want to see salmon getting caught or who would intentionally give out inaccurate fishing information so fully tune in when you're briefed on where or how to fish a specific salmon pool. Even if you're a better caster or the ghillie is half your age listen closely as all ghillies have the advantage of watching their salmon pools on a daily basis which tells them exactly where salmon are holding and what fishing approaches are working best. This type of quality intel is crucially important for maximising the fishing opportunity but is often ignored! If you show up on a mixed rod salmon fishing day where other unknown salmon fishers are making up the fishing numbers then respect their day out and hopefully they will respect yours. Don't 'heron' a pool or get upset with the ghillie's pool rotation plan if you can't get on to the main fishing hot spot first or twice throughout the day. Don't fish through the pools and leave them completely bombarded diminishing the next angler's chance but be careful and considerate to the other anglers and often you'll find reciprocation. There's also much more fishing satisfaction from hooking a salmon when you're last through the pool! Some of the most amazing people are to be found on the Scottish salmon rivers who've been drawn there by the same invisible force that got you there. Personally I've met and entertained thousands of them over the decades and the more I reflect back on that mega busy period of my life the more I realise that was the best time of all. Nothing beats the comradery in Scottish salmon fishing nor the buzz of building up your fly rod on a fishing day where you can sense the chances are spot on for some salmon action. The magnificence of the Scottish rivers and the sheer excitement and thrill of capturing a perfect fresh run salmon will always pare the Scottish rain into insignificance!